As a Customer Champion at Salsify, I’ve worked with hundreds of brands to centralize and syndicate their product content. However, our initial conversations with customers don’t usually start with our core product - we begin with trying to understand each customer’s current product content process. This is because for us, what is more important than selling our own product is solving problems for our potential customers. Ecommerce is by its nature an intensely cross-functional process, involving teams from across and outside the company. This means that establishing an efficient and sensible process that takes into consideration all-involved functions is imperative to a commerce company's success. From my collaboration with customers across industries, I’ve picked up on some best practices along the way to get you started on capturing, managing, and optimizing your product content process. All you need is a pen and some paper. A good understanding of your organization and your product content flow helps, too! Step 1: Identify the relevant teams involved in product content in your company. Who comes into contact with product content? Is it the R&D team? How about Marketing? Copy? Shipping? Legal? Once you’ve nailed down the teams involved in the process (this is different for every team), write down the point person for each team. Create a shared google doc for other members of your team to reference or tape up a list to your cubicle - whatever works! Step 2: Find the content creation source. 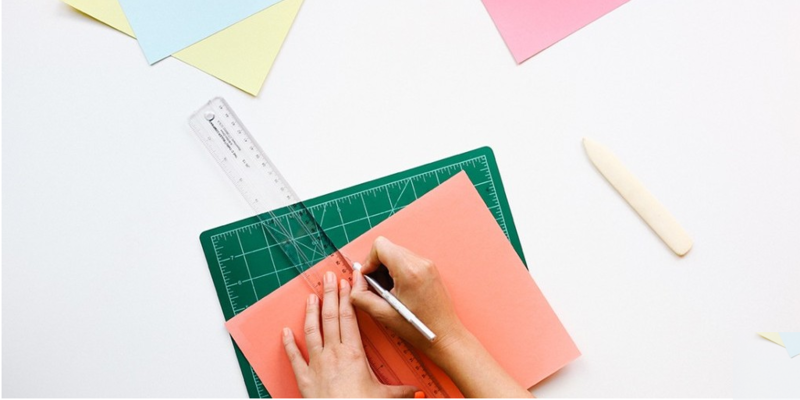 Where does the creative process for your product content creation kick off in your company? Maybe it even starts with someone outside your company, say if you are a distributor/retailer. At Salsify, some companies we work with start with taking a picture of the main image of a product, and then, pull in creative teams to produce copy for the product. Other companies begin with entering in R&D logistical information, moving on to supplement the content with rich attributes and then, focus on creating digital assets. It doesn’t matter how your process begins, but it is important to identify a starting point so that you can set up a process that works best for your whole team, and then get organized. In the first example, the content production workflow is kicked off by the R&D department who makes the decision to develop a new product, thereby triggering the process with logistical content first, followed by enriched content and digital assets. The approval process before go-to-market is owned by the legal team. After your legal team approves it, sales and your go-to-market strategy is put into motion. All of the content you’ve been working on is syndicated to sales, to your website, to retailers, and to product rating and review sites. Another interesting example is a workflow for product content acquisition by a distributor or a retailer. In this example, the basic content for a new product is received by the distributor or the retailer from its vendors/brands. 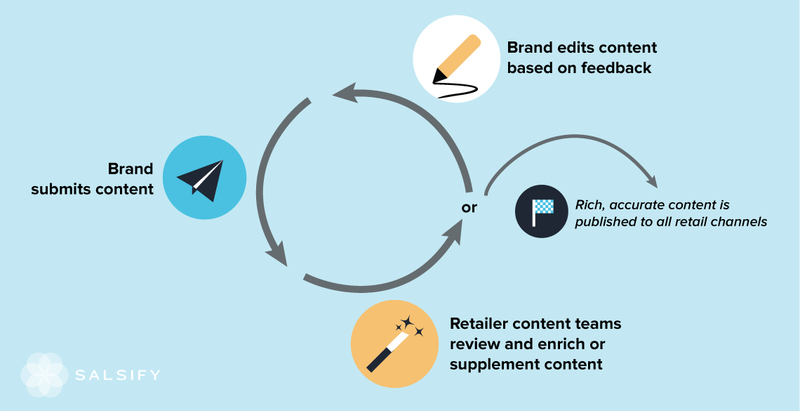 The distributor reviews the content, supplements it and preferably communicates feedback to the supplier who then makes another pass at the content before final approval by the distributor/retailer. *Your go-to market flow may vary depending on your organization. Step 4: Build in a series of checks and balances. Find where in the process you want to have a “double check” in place before the content funnels down to the next step. For example, maybe you want to review and approve the copy written by your creative team before you send it over to the media team to shoot the product image. 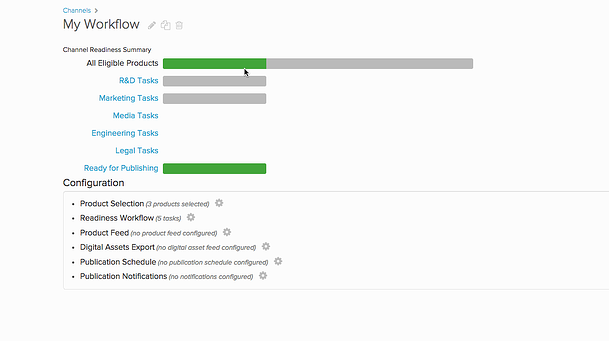 In Salsify, you can do all of this through our workflow functionality, which lets you define tasks, assign them to appropriate user groups, notify relevant users of tasks triggered for them, and track their progress. We think of a workflow much like a funnel - where a product flows through different buckets of tasks executed by different assignees. The process is both streamlined and incremental and removes the need for constant communication - when the first task (or bucket of tasks) is fulfilled for a certain product, it simply funnels down to the next, triggering the task for the relevant next team in line. Step 5: Repeat and revisit. Implement lessons learned as your teams go through the process. Keep the process flexible enough to tweak, and don’t be afraid to experiment!